The summer has been here for a while and for the weekend we decided to enjoy some strawberry picking. It was such fun picking these sweet luscious berries. We brought home a bountiful besides the many kilos we ate at the farm itself. I had to do something with so much – and only a cheesecake could do justice to this treasure. 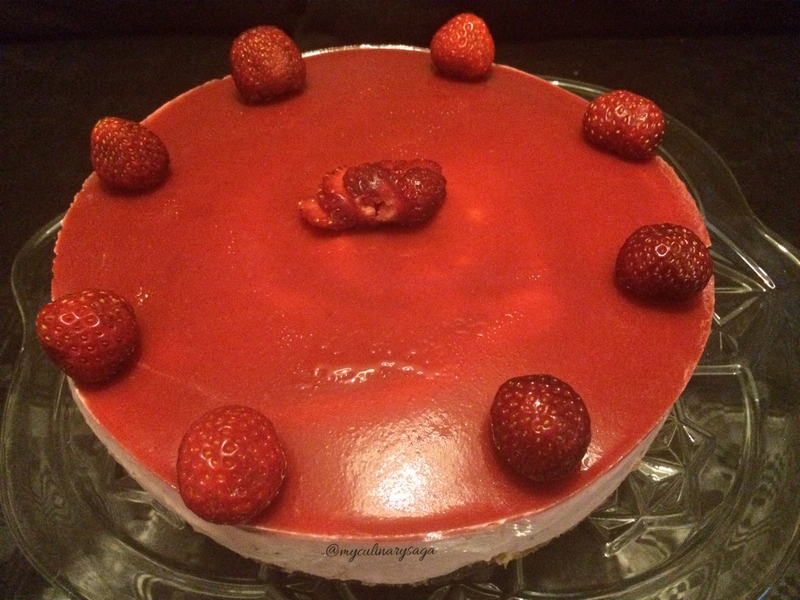 In the heat of summer this strawberry cheesecake is absolute perfection and divine. The fresh sweet berries and creamy cheesecake are layered on top of a rich crust. The best part of it – it is a no bake cheesecake. If you haven’t already checked my post on No Bake Lemon Cheesecake; do so now. Just because it is fast and easy to make doesn’t mean it is not gorgeous. 1. In a food processor grind the biscuits until they are broken into a fine powder. 2. Add the melted butter, salt and process until it is all well incorporated. You may have to scrape down the sides of the bowl a few times. 3. Press the crust evenly into the bottom of a 9-inch spring form pan. 4. Set in the fridge until the filling is prepared. 1. Soak the gelatin leaves in cold water in a small bowl. Allow it to sit for 4 to 5 minutes. 2. In a sauce pan, add the strawberry puree, sugar, and 2 tablespoons water. Cook over medium heat for 5 minutes. 3. Transfer the gelatin to the puree and gently cook over low heat, whisking just until the gelatin is completely dissolved. 4. Remove from heat and strain. 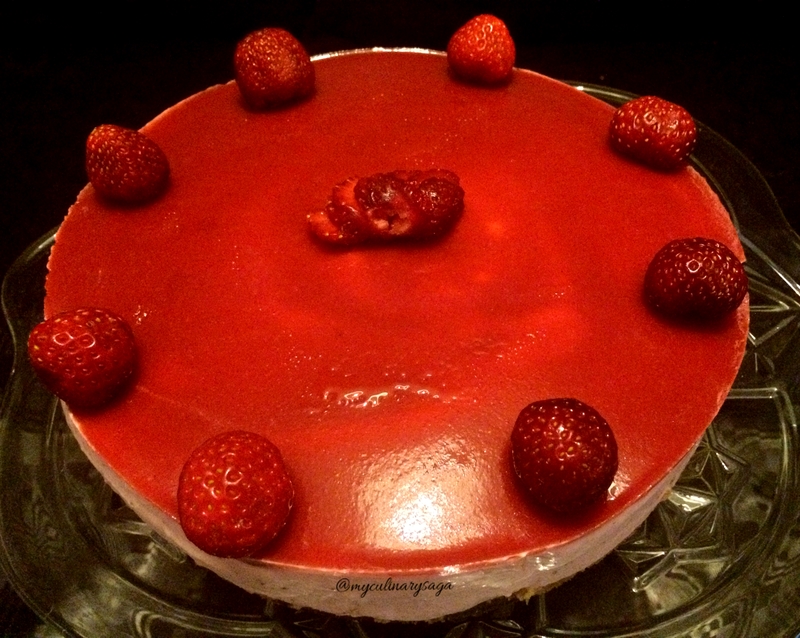 Cool and reserve this strawberry mixture for the top layer of the cheesecake. 1. In a bowl, beat the cream cheese on medium-low speed until smooth. 2. Pour in the condensed milk and whisk together. 3. Mix in the lemon juice and watch it thicken! 4. Add the strawberry puree and stir again. 5. In a separate bowl, whip the heavy cream until medium peaks. 6. Gently fold the whipped cream into the strawberry cheesecake batter just until it is all combined. Make sure you do not see streaks of cream. 7. Pour the cheesecake batter into the prepared pan. Tap the pan gently on the counter to bring any air bubbles to the surface. 8. Let it sit, uncovered, in the refrigerator for about 2 – 3 hours or until it is set to the touch. 9. Once the cheesecake is set, pour the strawberry topping over it. If the topping has set in the saucepan, gently heat it for a minute, just until it is pourable. 10. Place the cheesecake back into the refrigerator and allow to set, uncovered, for another 30 minutes, or until the topping is set. 11. It is now ready to serve. Before unlocking the spring form pan, run a knife around the edge of the cheesecake to loosen it. Top with the fresh strawberries.